Monday 12th June 2017 - A mixed bag - some sun, some rain and plenty of wind! We're nicely settled in now at Strand Camping Doonbeg, and our plan is to stay here for the next 2 or 3 nights. The site is quite lovely with very friendly owners, clean facilities, hot unlimited showers, pretty views and plenty to do around and about - so it's an ideal base for this part of our journey. But unfortunately, today we've been forced to lay off doing to much exploring because the muscle in the back of my right upper leg is complaining rather loudly - I think I may have overdone it in the last couple of days! So all we did today was go for a gentle walk (about 5 miles) and then in the afternoon we sat with our feet up while I explored the possibility of doing some 'house sitting' work for this winter. So instead we sat and sipped our coffee on the sandy shore before turning back the way we'd come, but with a detour to see the Blessed Well and the ruins of the parish church along with it's old cemetery where we found crypts and tomb stones from the early 1800's, but with some additions more or less right up to the present day! While we were exploring the sun managed to peak out so this seemed a very peaceful place to sit and eat our lunch - and the residents didn't seem to mind our company! Well firstly, I'm very glad to report that my leg is much better today, so with that in mind, but not wanting to over do it, we peddled off across the peninsula to the town of Kilrush - a there and back journey of about 25 miles but nearly all on the flat. Our main target today was the Vandeleur Walled Garden, which quite amazingly, was free to enter. 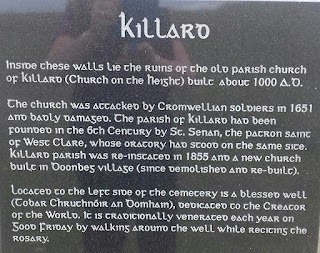 The garden sits in a property that covers 420 acres, but the walled area only covers a tiny 2.1 acres, however the whole area has survived over the century's with it's history starting back in 1687 when the Reverend John Vandeleur became Rector of Kilrush. These days the majority of the land is given over to forest walks but the Walled Garden provides a little oasis of colour and follies which we very much enjoyed exploring. Then after we'd finished there we proceeded over to the Kilrush Marina on the north side of the Shannon Estuary, and as we rode around it's border of it we came across Cappagh Harbour which provided an ideal and sheltered spot for lunch. And while we were there we learnt a bit of trivia - apparently Mohammed Ali's great grandfather emigrated from Cappagh Pier to New York in the 1860! It was also here that we learnt about the areas resident bottle nose dolphins who reside here throughout the year and often calve in these waters between April and September. Unfortunately we didn't see any on this occasion, but as we're staying in the area for a bit longer we might have better luck in the near future. After we'd peddled home we finished our day by sitting lazily in the sunshine - we don't have a hard life - but someones got to do it! Wednesday 14th June 2017 - Good start with lots of sunshine but blustery rain later. This morning we left the lovely Strand Camping site and took a short journey to The Bridges of Ross - which lie close to the small town of Ross on the Loop Head Peninsula. There used to be 3 'bridges' here but now only one of the sea arches remains intact - the other 2 gradually collapsed into the sea during the 19th century because of the battering of the waves which found weak spots in the sea stacks that supported them. However, what is left is truly stunning, and it would seem quite likely that in the millennia to come more similar arches will form. When we arrived we parked in the large car park that overlooks the sea, and almost immediately decided that this would be a good place to rest overnight. 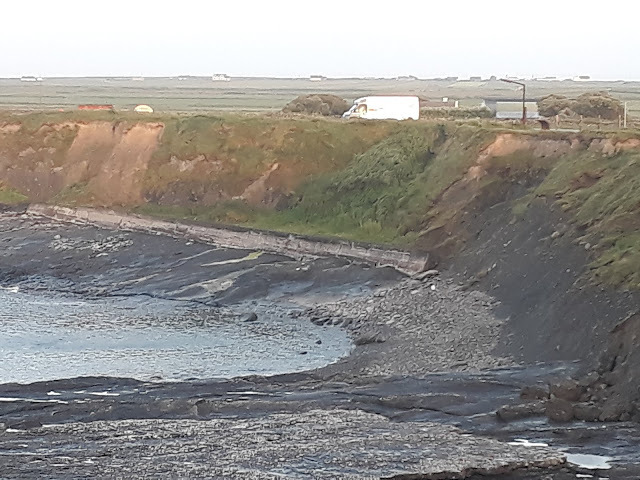 At that time the tide was retreating, but by staying we would have the opportunity to nip out nearer to high tide (10pm) to see this strange and almost 'other worldly place' as the waters rise! As soon as our coffee was gulped down we set off towards the remaining arch, and as we went we marvelled at the contortions of huge chunks of rock that seemed to have been torn away from the coast, or spewed up from depths far below on the sea bed, and in the end we felt these formations were even more magnificent than the arch itself. There were also quite a few caves that had been carved out of solid rock, and at times, it made you wonder if you were walking on solid ground or something that had been undermined by the action of the sea. In many areas the rocks were tilted and jagged, and parts of the path were narrow with only a long drop at the side - you maybe wouldn't want to be up there on a dark stormy night! Additionally, we were quite interested to read that at high tide the water is usually deep enough to jump into from the bridge arch resulting in you plunging down into the cold depths of the Atlantic below - but even though we're staying overnight we quickly decided we wouldn't be doing that! We took our time exploring the 'bridge' area, and then retired to T4rdis2 for lunch, however we didn't stay indoors long! There was much more to investigate by taking another little track in the opposite direction - and we soon found ourselves playing amongst the massive separated chunks of rock that had naturally formed steps that allowed us to climb high up to see over vertiginous drops down to the raging sea. Then as the skies darkened we retreated back to the van again, and from there we watched the rain sweep in and pelt down. Initially this was a phenomenon that almost obliterated our ocean views and we did wonder if it would spoil our late night stroll to see the high tide! But almost as we were giving up hope of being able to go out again the skies begun to clear and the sun glimmered out bringing with it a rainbow. So we wasted no time in donning our shoes again and going for another stroll to watch the boiling cauldron of waves heaving up the sides of the rocks and sending foam high into the air - it was almost like a firework display at times. Thursday 15th June 2017 - Mostly sunny but still very windy on this far flung peninsula! This morning we left the very quiet and unpopulated Bridges of Ross behind, but we didn't travel far - only about 5 miles along narrow roads to the tip of Loop Head Peninsula where one of Ireland's 70 lighthouses is situated. Apparently there has been a lighthouse there since 1670, but in those days it only consisted of a brazier on top of a single storey cottage. The present one came into service on May 1st 1854, and since then it has provided warnings to sea faring vessels to keep away from the very dangerous rocks that make up this part of the Irish coast line. When we arrived we found another big level car park with more magnificent views, but this time we weren't alone, and I'm sure T4rdis2 will have several pals to camp with tonight! For most people it would seem that the lighthouse was the main attraction, and there were quite a few folks up on the balcony admiring the views, but the thing that had drawn us was the opportunity for a bit of coastal walking and exploration. So with that in mind, we had two expeditions planned for our day - the first being a short walk around the coast to the left of the lighthouse, and then a longer trek in the afternoon in the opposite direction towards the hamlet of Fodry. We were only out for about an hour, but in that time we enjoyed seeing numerous wild flowers as well as sea stacks and caves along the way. Somewhat amusingly, we often also had the pleasure of dodging the huge plumes of sea spray that were being thrown up the cliff side - John almost needed windscreen wipers on his glasses to be able to see where he was going, and when we licked our lips we got an extra ration of sodium in the form of tangy sea salt! However, if we thought the morning walk was impressive, the afternoon one was vastly more so. Earlier we'd passed the famous sea stack Diamuid and Grainne Rock - or as it is locally known -'Lovers Leap'. The stack is a long narrow tall spit that just looks as if it has broken away from the mainland - but it was impossible to see down to the water because the steep sides wouldn't allow you to get close enough to the edge without the very real risk of falling in! But as we set off for our later walk we were able to look back and see the narrow channel of frothing heaving seawater that ensures the rock is bird territory only'. And why 'Lover's Leap'? Well legend tells that sweet-hearts Diamuid and Grainne fell in love, but she was due to marry an ageing chief - Fionn MacCool. 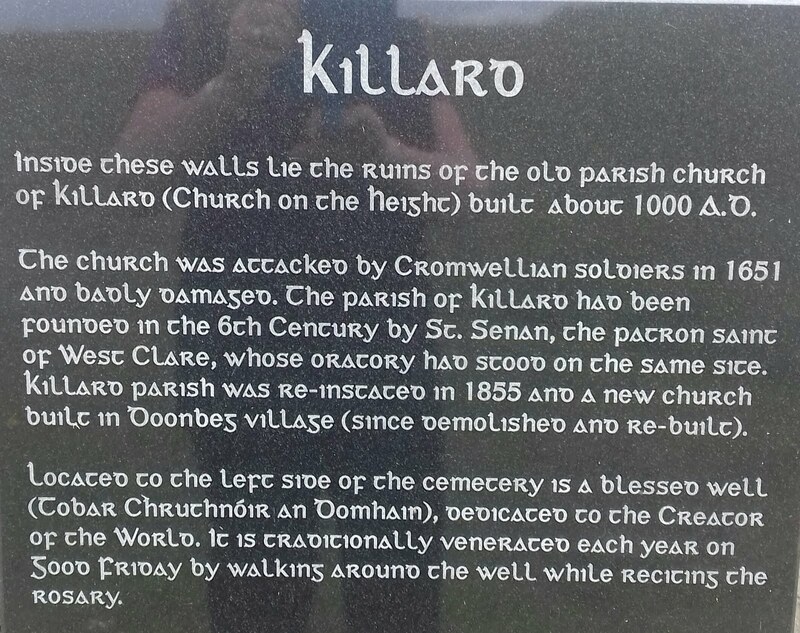 So to avoid this they fled across Ireland pursued by Fionn, and it is said they leaped and took refuge on the stack! Our second walk of the day took us along the northern coastline in an easterly direction, and we soon found ourselves passing by another striking sea arch where the waves writhed through tunnels and gaps in the rock with what seemed like gay abandon. There were also myriads of birds ducking and diving because this area is a major nesting colony, so almost every ledge provided a home. In many places the cliffs were almost perpendicular and shear and the sea constantly crashed into them regardless of if the tide was coming or going, and it almost seemed that the further we went the more breathtaking the vista became. But the going underfoot was quite rough, and sometimes the path disappeared altogether, leaving us to just pick our way the best we could, so after we'd been walking for a couple of hours we decided it was scone and coffee time. And for our comfort it was easy to find a convenient ledge to peach on while we indulged in a bit more wave watching - in these parts it's a spectacular occupation that we've decided we could indulge in for many hours! However, we didn't linger to long because we still had a 2 hour trek back, and as we had to force our way into the very strong wind for most of it our return march was quite exhausting! Anyway, once we were back in the van we soon settled down and my above ramblings were quickly completed as best I could without any availability of wifi to publish - and that's why our story is running a day behind! But tomorrow we should be back in the land of technology and communication masts, so if your reading this we made it back along the narrow roads to civilisation!